This pdf is 13 pages long, 1 page front cover, 1 page advertisement, 1 page editorial/ToC, 1 page SRD, 1 page back cover, leaving us with 8 pages of content (though one is taken up by a full-page b/w-artwork), so let’s take a look, shall we? Want an example how Raging Swan Press listens to customers? This pdf would be one – when reviewing the Wilderness Dressing for regular forests, I suggested further supplements for other types of forests – and this is one. Whether it’s the Margreve or a similar ancient forest, this pdf has got you covered regarding the weird and wondrous things that can be encountered herein, with the first table sporting a whopping 100 distinct entries – and oh boy, these are GOLD. Pony-sized rabbits hopping through the forests, eerie mists settling at noon, will-o-wisp-like motes of light beckoning off the trail, animals warning of big teeth – these are not forests men often tread – all the more disturbing once the PCs find a filled, abandoned picnic basket or are showered with weird cocoons… Being hit by smelly shroom-spores, listening to the conversations of woodpeckers, falling potentially victim to tumbling trees or spheres of frogs that are unceremoniously dumped on the PCs – these entries breed primal wonder and the spirit of faerie-tales, instilling a subtle certainty of antiquity. The second table provides yet more, in fact 100 dressings, many of which also feature crunchy consequences and short rules to supplement them, while retaining the superb quality of the first table’s entry: From allegedly extinct trees to harvestable wild mistletoe and streams that mysteriously turn blood red for seconds before returning to their normal coloration, wonder and a sense of not being in Kansas anymore is breathed by every word within these tables. The final table of the book offers 12 different random encounters, following the format of the Dungeon Denizens-series, offering the respective critter, the bestiary in which they can be found as well as a short piece of fluff herein – from hunting bandersnatches seeking to outdo one another to a jubjub bird and even a forest giant with her aurumvorax, the sample creatures fit well in tone with the respective atmosphere. Editing and formatting are top-notch, as expected from Raging Swan Press’ almost immaculate track-record. Layout adheres to Raging Swan Press’ crisp two-column b/w-standard and the pdf comes fully bookmarked for your convenience and the pdf comes in two versions, with one optimized for screen-use and one to be printed out. Each entry a mystery, a hook, a peculiarity – this is pretty much the apex of what can be done within the constraints of tables. 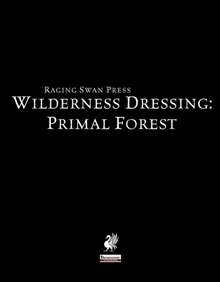 This pdf is extremely awesome – author Mike Welham, not by incident one of the people whose name you’ll notice on a LOT of great supplements, has created a Wilderness Dressing-installment that is simply legendary. This is perhaps my favorite installment in the WHOLE product-line. It’s that good. If there was an option for me to rate this higher – I would. For fey woods, for the Margreve, for any magical forest or for DMs seeking to add the extraordinary to their game, this is a required, awesome purchase and can only get one verdict – 5 stars + seal of approval – and is a candidate for my Top Ten of 2013. Want some magical forest? Then GET THIS! You can do so here on OBS and here on d20pfsrd.com’s shop!